Dr. Valiny Rodrigues completed her BDS degree in 2009 from D.Y.Patil Dental University, Mumbai, India. 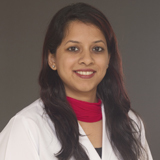 Since then, she has experience in clinical dentistry in both hospital and clinic environment; including working at a prestigious hospital and research centre in Mumbai; and her own clinic in Pune, India – one of the few accredited clinics of the Indian Health Organization (a part of Aetna Inc., USA). Dr. Valiny has a comprehensive and multi-disciplinary approach to clinical dentistry. She has special interest in cosmetic and restorative solutions; incorporating patient education and disease prevention into treatment plans to result in a healthy, beautiful and confident smile. She holds membership in the Indian Dental Association and is a lifetime member of the Indian Academy of Aesthetic and Cosmetic Dentistry. She spends her spare time writing for publications and running marathons for charity.